So can using your cell phone cause cancer? According to a recent study on mice placed in a room, bombarded with whole body radiation for 9 hours a day (because no one makes tiny cell phones for mice) for a period of 2 years (e.g. lifespan of the mice), the answer is, maybe. If you really want to know what’s going on. You have to understand the electromagnetic spectrum. I like this picture from the Hong Kong Observatory website. See how the waves change from left to right? So does the energy. 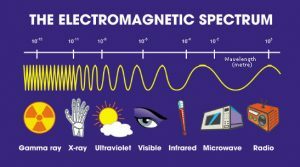 So the electromagnetic radiation (X-rays or gamma rays) on the left side of the photo has a high enough frequency, and short enough wavelength, to result in cellular damage when it comes into contact with a human cell, or more precisely, an atom. This is ionizing radiation. The x-rays hit a cancerous tumor, and knock an electron out of an atom, causing that atom to become an ion. The ion then goes on to do some cellular damage that ultimately results in DNA damage to the tumor cell and it dies off. However, ionizing radiation can also damage normal cells that then are unable to repair themselves. When this happens, there is the risk of developing a tumor later in life. The risk is low, but does exist, and depending what other risk factors you have for cancer (read my Forty-Two Percent blog here) your risk could be higher. Here’s another picture. I like this one better – more colors. Back to the cell phones. Most of us in the medical and scientific community have a very low suspicion that cell phones cause cancer because cell phones don’t emit ionizing radiation. 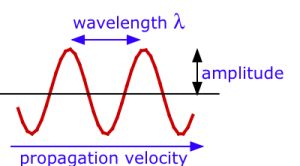 Cell phones, like microwaves and radio waves, have longer wavelengths and lower frequency = lower energy. This type of non-ionizing radiation is however absorbed by the human body. So does it have any bad effects? Note that the NIH states there is “no consistent evidence”. That’s your first clue. Doesn’t mean there isn’t a study that shows a risk to non-ionizing radiation, like the mouse study. It just means that when you look at all the studies together, and scientifically analyze them, that there is no definitive conclusion. So this brings us to the mouse study. It was a well-done study and the data was compelling. You can read the details here if you haven’t already read other commentary on it. In my opinion, based on my understanding of the available medical science to date, I recommend minimizing the amount of time your cell phone is next to your body. The most recent mouse study is just that, a mouse study, and there are many studies showing effects on mice that cannot be duplicated in humans. With that said, the mouse study is a piece of data, that when combined with other data, including recommendations from the International Agency for Research on Cancer (IARC), shows we need to be concerned about the non-ionizing radiation that we absorb over our lifespan, especially when we consider exposure to children. What do expert organizations conclude about the cancer risk from cell phone use?